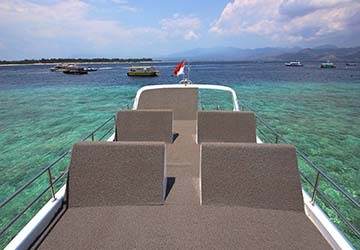 Gili Getaway;s fleet consists of three almost identical Fibre Glass Deluxe fast boats servicing the gorgeous Gili Islands. 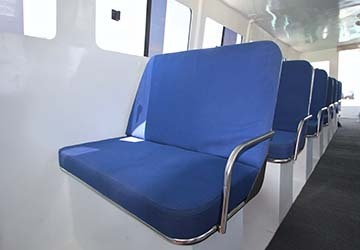 Each ship comfortable caters for 35 passengers on their luxurious sunbrella cushioned seats. 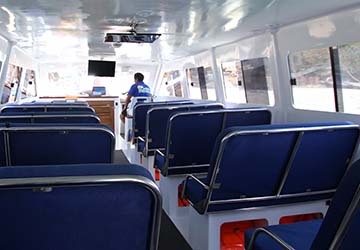 The boat contains a personal Wi-Fi headphone system so you can enjoy on board movies as you travel. There is also a state of the art GPS system so you can track your journey. The ship's sundeck boasts a sun baking deck with personal back supports with padded cushions for comfort and safety as well as individual storage units inside the back rests for phones, Kindles, music devices and other personal belongings. You'll also find outside covered seating for those who want to take in the beautiful views and breeze without being in the sun. 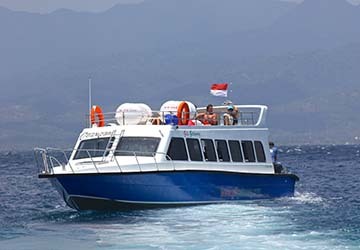 International safety standards and safety equipment all combine to provide a high speed, ‘Deluxe Class’ transfer to and from The Gili’s, Lombok and Bali in the safest manner possible. Please Note: Whilst we have taken great care in making our Gili Getaway guide as accurate as possible, onboard facilities, services and entertainment may vary depending on the date and time of year that you travel, facilities mentioned may change without notification and ferry companies reserve the right to operate vessels other than those mentioned at time of booking without prior notification.